A 19-years-old female was reported to the orthodontics department, with the chief complaint of unaesthetic smile. Intraoral clinical examination revealed that she had all her permanent dentition except for the retained deciduous mandibular right canine. She had Angle's class II division 1 subdivision right malocclusion with fractured upper left central incisor (Ellis and Davey's Class II #),  and missing upper right central incisor [Figure 1]a-d. Her medical history was non-contributory whereas dental history reveals extraction of upper right central incisor at the age of 16 years (as it was badly fractured due to trauma and had periapical pathology). Routine orthodontic diagnostic procedures were carried out including cast analysis, panoramic, occlusal radiograph and lateral cephalogram [Figure 1]e-f.
On orthopantomogram examination we observed the lower right canine to be in position of mesioangular impaction (more towards horizontal) below the apices of lower left central and lateral incisor (type 2 of Mupparapu pattern of transmigration)  [Figure 1]e. Cephalometric findings suggest that the patient was skeletal class I (SNA-80°, SNB-77°, ANB-3°), mild dent alveolar protrusion (Interincisal angle-134°) and mild hyper divergent mandibular plane angle (SN-MP-38°, FMA-31°). Space available for the upper right central incisor was about 4 mm due to tipping of adjacent teeth [Figure 2]b. Based on the diagnostic records, the interdisciplinary approach for the management of case was selected. As resorbed root of deciduous mandibular canine and mobility on clinical examination were not in favour of long term prognosis, thus extraction of deciduous canine was planned. As mentioned above in treatment options section, if the patient had normal position of lower incisors, space for the impacted canine can be created easily (generalized spacing in lower anterior teeth) and the patient was symptom free , then the transplantation may be a treatment choice. The treatment plan options were presented to the patient and her parents, and they agreed to follow the surgical repositioning of the impacted canine plan, consent was taken from patient and parents. With presurgical orthodontics, alignment of the maxillary and mandibular arch was done before canine replantation. Oral prophylaxis was performed and patient was advised to use Betadine mouth wash (thrice a day). Patient was instructed to brush her teeth after every meal and to avoid hard, sticky food substances. The goal was to maintain proper oral hygiene to minimize the chances of failure. Restoration of fractured upper left central incisor was done with light cured composite resin (tooth colored material) for aesthetic reason. It also facilitates accurate positioning of bracket on the tooth [Figure 2]a.
Pre-adjusted orthodontic appliance (Roth prescription 0.022"×0.028"slot) was bonded to the maxillary and mandibular teeth except the deciduous mandibular right canine [Figure 2]a-d. Alignment and leveling was started in maxillary and mandibular arches by ligating 0.016''NiTi wires that were changed sequentially to 0.018'' stainless steel and then 0.016''×0.022'' stainless steel arch wire. Open NiTi coil spring (0.036") was compressed between upper left central incisor and upper right lateral incisor to gain adequate space for the lost upper right central incisor (For 4 months). The faulty angulations of adjacent teeth were corrected simultaneously with the creation of required space for fixed prosthesis of upper right central incisor [Figure 3]a. Stainless steel 0.021"×0.025" wire was used as a stabilizing arch wire. In the mandibular arch the laceback mechanism of ligature wire (0.007") were followed (from the lower right first premolar to lower right first molar buccal tube and from the lower right lateral incisor to the lower left first molar buccal tube) to consolidate the generalized spaces which were present between the anterior teeth. 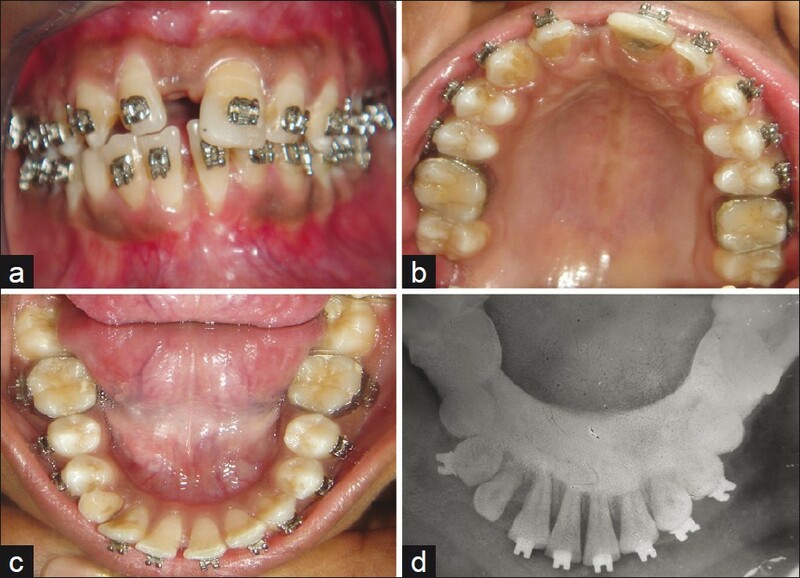 [Figure 3]b Active orthodontic treatment time was about 8 months. Before surgical repositioning of impacted lower right canine the lower arch was debonded to facilitate proper oral hygiene maintenance [Figure 3]c.
The tooth was laxated and extracted but kept in the socket to maintain the viability of periodontium. The primary canine was extracted simultaneously to avoid second dose of local anesthesia and recipient site was prepared by using sterile stainless steel burs with proper irrigation of saline to avoid heat generation at the surgical site [Figure 4]c.
The impacted permanent canine was removed, pulp was extirpated and canal was filled with Ca (OH) 2 paste, then it was transplanted in the recipient site and secured in place using a semi-rigid wire splint. Silk 4/0 suture was used to close soft tissue flap [Figure 5]a-d. The endodontist and the maxillofacial surgeon performed their work simultaneously to reduce the critical period (the time tooth was outside the socket was 15 minutes). Finally the root canal was sealed with Gutta percha after 8 weeks of replantation. Analgesic/ anti-infla­mmatory (Ibuprofen - 600 mg, 1 tablet / 8 hours for one week) and antibiotic (Amoxicillin - 875 mg / Clavulanic acid - 125 mg, 1 tablet as a initial dose then Amoxicillin - 500 mg / Clavulanic acid - 125 mg, 1 tablet / BID for a week) medication was prescribed during the postoperative period. Patient was recalled a week later and the healing was progressing normally. Sutures were removed and oral hygiene instructions were given. At that time, the mandibular anterior teeth were tested for pulp vitality; the response of the pulp was within normal limits. The autotransplanted tooth was secured by the semi-rigid fixation with an acid-etch composite for 3 weeks. Both the esthetics and function were restored to an ideal level in the absence of postoperative complications, and marginal bone support appeared similar to that of the neighboring teeth as evidenced by clinical and radiographic findings. Periapical radiolucency related to the replanted canine may be related to the socket preparation during the replantation procedure [Figure 6]a-g. At 1 year of follow up of transplanted tooth, the periodontal condition was good with no gingival recession but a small radiolucency (localized external root resorption) was observed at the distal side of the apical zone of the root surface in the panoramic radiograph and axial section of CT scan [Figure 7]a-c. Fixed prosthesis (Porcelain Bridge) for upper right central incisor was made and cemented after debonding the arch. The transplantation has an uncertain long term prognosis, so regular (yearly) follow up is required to assure long term success. Patient was advised to avoid biting of hard substances at the region of transplanted tooth. Duration of total treatment time was 14 months (Active treatment phase 8 months and retention period of 6 months with mandibular removable appliance). The incidence of mandibular canine transmigration is very un­common. Eruption of transmigrated teeth is a rare condition, which occurs in approximately 5% of cases. Similarly, bilateral transmigration is also an unusual phenomenon. Büyükkurt et al. did not report any bilateral transmigration in their report. Joshi  reported four bilateral transmigration of 28 pa­tients in his report. Generally, it is assumed that the shorter the extra-oral period of the tooth, the greater is the chance of healing. It is suggested that it should not exceed a 30-minute-limit. The vitality of the periodontal ligament (PDL) cells on the root surface depends on the extra-oral period. It guarantees the regeneration of it scanting elements as well as the healing of bone and epithelial attachment. The prognosis of transplantation is best if the tooth is transplanted immediately after extraction into the alveolar socket. Replanted teeth must be splinted for 3-4 weeks for secondary revascularization to occur in contrast to a shorter splinting time for teeth with developed roots and closed apex. Radiographic control 2-3 weeks after the procedure is advised to check if root resorption or bone pathosis has occurred [Figure 5]d.  Mineral trioxide aggregate is used as an alternative method, placed at the end of the canal during 1 month of Ca(OH) 2 application, with simultaneous obturation with gutta percha. To provide long-term survival of the transplanted tooth, skilful and delicate handling is needed. Right before insertion into the alveolar socket, it is advised to clean the tooth by immersion, rinsing with physiologic saline, being careful not to damage the periodontal ligament. Manipulation, mechanical cleaning or disinfection is not allowed. The tooth should only be held by the crown, without touching the root surface. Endodontic treatment is essential for the progress of the healing process of the replanted tooth. Authors consider that it is necessary to extirpate the pulp, prepare, and fill the canal with calcium hydroxide directly after splinting on the same day of the tooth transplantation. Skilful and delicate operator can then minimize the severity of the trauma to the regenerating PDL. Early detection and appropriate intervention can prevent the possible future complications caused by the transmigrated teeth. Therefore, clinical evaluation followed by a detailed radiographic screening is vital to achieve an accurate diagnosis of these teeth and optimal management. Transmigration of the mandibular canine is a rare event, and early radiographic examination of a patient is important for treatment planning. Surgical repositioning is especially valuable in cases of difficult-to-treat impaction. In this case intraoral periapical radiograph 1 year after replantation shows good periodontal health of the lower right canine , but a small radiolucent area was observed at the distal surface of the root at apical 1/3 rd . Intra oral periapical X-ray of reimplanted tooth was advised at 6 months interval regularly to monitor the changes at radiolucent zone. 1. Javid B. Transmigration of impacted mandibular cuspids. Int J Oral Surg 1985;14:547-9. 2. Joshi MR. Transmigrant mandibular canines: A record of 28 cases and a retrospective review of the literature. Angle Orthod 2001;71:12-22. 3. D'Amico RM, Bjerklin K, Kurol J, Falahat B. 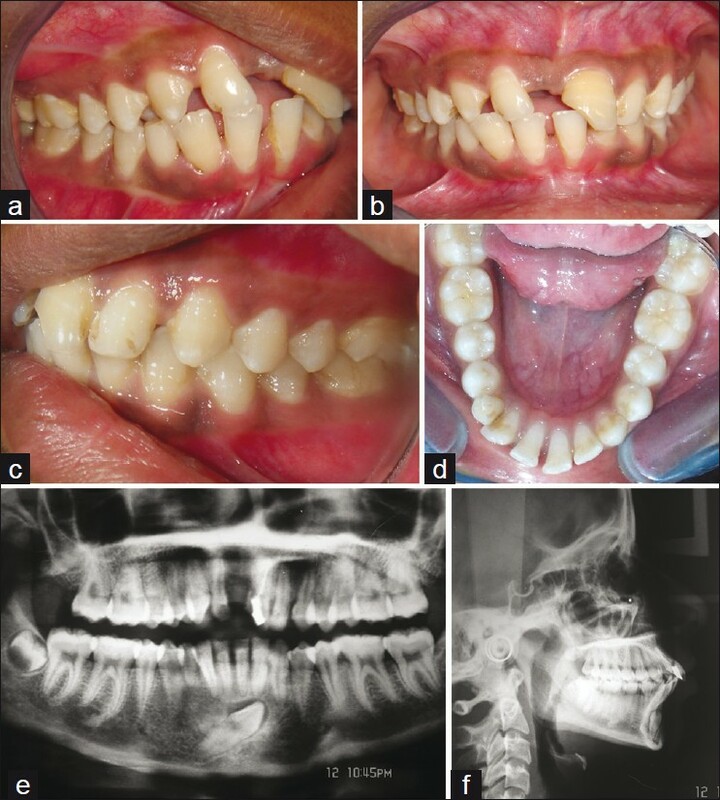 Long-term results of orthodontic treatment of impacted maxillary canines. Angle Orthod 2003:73:231-8. 4. Aktan AM, Kara S, Akgunlu F, Isman E, Malkoc S. Unusual cases of the transmigrated mandibular canines: Report of 4 cases. Eur J Dent 2008;2:122-6. 5. Bruszt P. Neurological anomaly associated with extreme malposition of a mandibular canine. j Oral Surg (Chic) 1958;11:89-90. 6. Ando S, Aizaea K, Nakashima T, Sanka Y, Shimbo K, Kiyokawa K. Transmigration process of impacted mandibular cuspid. J Nihon UnivSch Dent 1964;6:66-71. 7. Shapira Y, Kuftinec MM. Unusual intraosseous transmigration of a palatally impacted canine. Am J Orthod Denofacial Orthop 2005;127:360-3. 8. Yamaoka M, Furusawa K, FujimotoK, Uematsu T. Completely impacted teeth in dentate and edentulous jaws. Aust Dent J 1996:41:169-72. 9. Tandon S. Text Book of Pedodontics, 2 nd ed: chapter 43; Oral and maxillofacial injuries in children: Hyderabad, Paras Publications; 2008. p. 569. 10. Mupparapu M. Patterns of intra-osseous transmigration and ectopic eruption of mandibular canine: Review of literature and report of nine additional cases. Dentomaxillofac Radiol 2002;31:355-60. 11. McDonald F, Yap WL. The surgical exposure and application of direct traction of uneruptedteeth. Am J Orthod 1986:89:331-40. 12. Ferguson JW. Management of the unerupted maxillary canine. Br Dent J 1990:169:113-4. 13. Shanmuhasuntharam P, Boon LC. Transmigration of permanent mandibular canines. Case report. Aust Dent J 1991:36:209-13. 14. Bishara SE. Impacted maxillary canines. Am J Orthod Dentofac Orthop 1992:101:159-71. 15. Plumpton S. The extraction of mandibular teeth via an extra-oral approach. Br J Oral Surg 1966:4:127-31. 16. Teixeira CS, Pasternak B Jr, Vansan LP, Sousa-Neto MD. Autogenous transplantation of teeth with complete root formation: Two case reports. Int Endod J 2006:39:977-85. 17. WitoldKuroczko, Anna M. Szyszkowska. Teeth reimplantation: Dental surgery department, Medical University of Lubin; 2007: vol.LXII,N1,1 . 18. Caldwell JB. Neurological anomaly associated with extreme malposition of a mandibular canine. J Oral Surg (Chic) 1955;8:484-7. 19. Sumer A, Sumer M, Ozden B, Otan F. Transmigration of mandibular canine: A report of six cases and review of literature. J Contemp Dent Pract 2007;3:104-10. 20. Torres-Lagares D, Flores-Ruiz R, Infante-Cossío P, García-Cal¬derón M, Gutiérrez-Pérez JL. Transmigration of impacted lower ca¬nine. Case report and review of literature. Med Oral Patol Oral Cir Bucal 2006;11:E171-4. 21. Buyukkurt MC, Aras MH, Caglaroglu M, Gungormus M. Transmigrant mandibular canines. J Oral Maxillofac Surg 2007;65:2025-9. 22. Slagsvold O, Bjercke B. Autotransplantation of premolars with partly formed roots. A radiographic study of root growth. Am J Orthd 1974;66:355-66. 23. Clokie CM, Yau DM, Chano L. Autogenous tooth transplantation: An alternative to dental implant placement? J Can Dent Assoc 2001:67:92-6. 24. Andresson L, Bodin I. Avulsed human teeth replanted within 15 minutes a long term clinical follow-up study. Endod Dent Traumatol 1990;6:37-42. 25. Krasner P, Rankow HJ. New philosophy for the treatment of avulsed teeth. Oral Surg Oral Med Oral Pathol Oral Radiol Endod 1995; 79:616-23. 1 Orthodontic management of a dental anomaly pattern (DAP) including mandibular canine transmigration: A case report: A challenging treatment but worth it!